Experience a true mountaineering adventure into a remote part of Nepal that has seen few western travellers in recent years. At over 7,000m, Himlung will for many become a significant stepping stone on the journey to the world’s highest peaks. For others, the allure may be to climb in a remote and uncrowded location on a very high Himalayan peak. Ascend two major Himalayan peaks, one above 7,000m! An ideal ascent for those looking to push their altitude experience to a new level. Himlung is an attractive 7,000m summit situated in Nepal’s Gandaki region near Annapurna. We approach the region by first travelling through Mustang to Lo Monthang, the lost city at the head of the Kali Gandaki valley. A high pass takes us to Saribung which we climb via easy slopes. We then trek on through Phu, an ancient and rarely visited region on our approach to Himlung. Now acclimatised, we ascend Himlung in alpine-style over the next week. The climbing is on predominantly low angle terrain and involves ascending through four camps over snow slopes before embarking on a direct ridge to the summit. The climbing on this expedition is not technically difficult, which makes it attractive for climbers wanting to discover how they perform on a 7,000m peak. This expedition provides a compelling reason to journey into the heart of the Himalaya, and climb a high peak in the Nepali wilderness. An ascent of these mountains will increase your confidence at altitude and is an exceptional adventure in itself to this remarkable corner of the Himalaya. Prospective climbers will need a high level of fitness and would benefit from previous exposure to altitude and experience of mountaineering skills. The balance is payable 90 days prior to trip start date. The Expedition Trip Notes provide detailed information and background for Adventure Consultants' Himlung & Saribung Expedition via the Mustang region. For the Himlung expedition we will take a minimum of 6 people and a maximum of 12 people, hence spaces are limited. The Himlung and Saribung Expedition is being organised and run by Adventure Consultants and will be operated to the same high standard we have for all our expeditions. Adventure Consultants expedition staff, along with the operations and logistics team at the head office in New Zealand, provide the highest level of backup and support to the climbing team in order to maximise your chances of success. This is coupled with a very strong expedition guiding team and Sherpa contingent, who are second-to-none in the industry. The expedition leader will be scheduled approximately six months out from the trip start. All of our trip leaders have extensive experience at high altitude and a proven record of safety, success and compatibility. Our international guiding staff are the best in the industry. You will find the Adventure Consultants mountain guides companionable and strong expedition leaders with considerable abilities and a willingness to see you achieve your goals. The number of guides is determined by the team size but the normal ratio of guides on Himlung is 1:6. and the ratio of Sherpas is 1:2. We have a legendary group of Climbing Sherpas, many who have been with us since 1992 and who operate in a harmonious atmosphere of cooperation and commitment to the expedition and its members. They are very experienced mountaineers who have dozens of ascents of the highest peaks in the Himalaya between them. They are enthusiastic, motivated and regarded as amongst the strongest and most cohesive group of Sherpas operating in the Himalayas. They are a humble yet friendly group of people and their contribution to the expedition is most impressive. Our cooking staff are very well known for the sheer quality of the cuisine they produce. The array of food and the variety they present is phenomenal especially when considering they are doing all this from a kitchen that is moved on each day of the trek! We have been developing and training the personnel within our Sherpa team for many years and they are an integral part of the Adventure Consultants Team. The climbing route on Mount Himlung is not an especially technical climb, yet prospective climbers should be well versed in the use of crampons and ice axe. Your guide will assist team members to develop the additional techniques required for the climb such as fixed rope work etc. What is imperative before you arrive is a very good level of fitness and stamina for the climb. Climbing at very high altitudes is very demanding and team members must be prepared to carry all their own clothing and equipment on the mountain and contribute to expedition tasks such as cooking at camps on the mountain. If need be, we can arrange a personal Sherpa for those who need assistance with load carrying so please arrange this with us during the booking process. If you put the work into your training, the rewards will be significant and you will certainly gain a substantial insight to the world of high altitude mountaineering. The climbing days will be between 6-8 hours with a longer day on summit day (10-14 hours) including the descent back to a lower camp that day. The outcome of the expedition will be determined by three factors. The first is Weather and Snow Conditions. Next is the logistical approach taken by the expedition leaders and the strategies employed to embark on a summit bid. The final factor is your own preparation in the months prior to the expedition and how you perform whilst the expedition is underway. You will need to embark on a training program that will prepare you, both physically and mentally, for the climb. You must make it a priority to commit the time and energy to your training to ensure you are ready for the rigours of the expedition. You don’t need to be superhuman, but you do need to be strong and have good cardiovascular fitness. See our Fitness Training Programs for information on how we can help you prepare for the expedition. Every step of the way, our office staff will be there to answer your questions. If they can’t, they will be happy to put you in touch with one of our Senior International Guides who can answer what questions you may have. We have the luxury of porter support during the trek. Each day you will carry your daypack containing; rain jacket, fleece, sun block, water, snacks, trekking poles, small personal first aid kit, camera and a few extra personal items. At higher elevations you add in a warm hat and gloves. Once on the mountain you will be carrying 15-20kg in weight, depending on how much personal gear you take, but this is all part of the process of expedition climbing on Himlung. Food will be of the highest standard possible, given the remoteness of the situation. Please inform us if you have any special dietary requirements. During the trek to Base Camp we will be dining in Lodges and at tent camps. At camps we will be eating in the dining tent where food will be prepared by our expedition cook and support crew. Our camp equipment and ample, nutritious meals are always the envy of other groups along the way! We do recommend that you bring some of your favourite snacks like energy gels, muesli bars, chocolate and/or candy to supplement the snacks that we have. Accommodation and dining during the trek will be in lodges where you will be accommodated in dormitories or twin rooms. Mattresses are provided but you will need to bring your own sleeping bag. Each lodge has a large lounge and dining area where trek members can congregate to share meals, socialise or simply relax by the fireplace. Some even have showers, internet, battery re-charging and laundry services available for a small fee. So please bring soap, shampoo, shavers, a towel, ‘wet wipes’ etc. When you are at Himlung Base Camp you will be camping in tents. Our trip will initiate in Kathmandu, the colourful capital of Nepal and the next day, we fly to the picturesque town of Pokhara. After an evening discovering the pleasures of Pokhara, we fly to the high village of Jomsom beneath the 8,000m massifs of Annapurna and Dhaulagiri. This is where we leave the tourist route and trek through the lower Mustang, where spectacularly fluted cliffs of red hues overlook the Kali Gandaki River. The Kali Gandaki flows from the high plains of Tibet through Mustang into Nepal before flowing into India. The upper Mustang is dominated by an endless expanse of yellow and grey rolling hills made smooth by the wind. We traverse this lonely landscape via several passes (the highest being the Nyi La at 4,010m), camping in villages nestled in the midst green irrigated oasis until we reach the spectacular ancient walled town of Lo Monthang. Visually, this is an extraordinary place and home of the Mustang Raja (King) as well as some beautiful temples and monasteries. The people of Upper Mustang are always curious about new arrivals, and we can expect children with windblown hair and apple red cheeks will gather to confront the spectacle of foreign visitors. The abrasive lifestyle required to survive is easily evident here. After taking time to explore the area and interact with the local population. It is from here that we will start to really move away from the beaten path. Over the next days we will slowly make our way through a barren Tibetan landscape towards the 6,050m Saribung Pass. Our acclimatisation schedule is gentle and we will ensure that we have plenty of time to adjust to these new heights. From the pass we will then climb the non-technical but glaciated Saribung at 6,328m. After this ascent we will continue the trek onto Himlung Base Camp via the phenomenally scenic village of Phu. The Base Camp is in a beautiful grassy spot with a waterfall and amazing views around us. Since we are well acclimatized by now, we can climb Himlung ‘Alpine Style’ which means that we can head straight up the mountain utilising four camps as we go. No need to go up and down to acclimatise and then rest as in a standard expedition. Over the next week we will wait for a suitable weather window and climb Himlung, hence completing an amazing remote double ascent. Our summit phase has several alternate days available to provide weather contingency and give us the best opportunity to enjoy our climb, and reach the top in good condition. The climb will be sufficiently strenuous that participants should come with a very good level of fitness and be prepared to carry a pack at altitude up to 20kg. 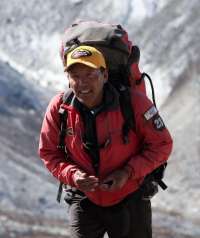 We can arrange Sherpa support to help with your personal load carrying if this is required. The walk out from Himlung will be relatively quick with stunning scenery as we re-enter the greener lowlands, and we will eventually find ourselves back on the Annapurna Circuit and driving back to Kathmandu. We are also able to offer Privately Guided Expeditions where you have the services of a top AC western guide as well as your own Sherpa support team to work exclusively with you on the expedition to ensure your needs are best met. AC have been fortunate to work with many privately guided groups over the years with exceptional results. Your family or friends may wish to join you on your Expedition but may not like the idea of actually climbing a mountain. We can arrange for them to accompany you on the trek. Please contact us for more information. This option provides you with the assistance of a very experienced and dedicated Sherpa who will support you for the duration of the expedition above Base Camp. Your Personal Sherpa will climb with you each day while you are climbing on the mountain as your climbing partner and generally assist you throughout the expedition all the way to the summit. When on the mountain, you would share a tent with your Personal Sherpa and he would supervise cooking duties. Our Sherpa guides are very experienced with multiple Himalayan ascents under their belts, and are friendly and supportive companions along the way! You may also like to talk to us about other options such as personal communication systems (own BGAN satellite connection and laptop at Base Camp), or the provision of a personal tent on the mountain. Have a cameraman join your expedition and document the entire thing! Choose from a variety of options for different budgets. You could have a full colour book and short film, or a full documentary for television. Your trip is the trip of a lifetime; why not keep it to show your friends and family. Contact us or see our specialty Film and Photo Services page for more information. The following is to serve as a helpful guideline on our Himalayan ascents. Please feel free to contact us if you have any further questions. Our team is here to help! We are renowned for the quality of service and strategy applied to our treks. Our reputation is attributed to the meticulous planning and logistics coordination done by our head office. Once on the ground in Nepal, you can expect to be well looked after by our guides so that you can relax and enjoy climbing in this amazing country. What showers and laundry will be available on the expedition? For lodge-based treks, many teahouses offer hot showers for a fee and at Base Camp we will often set up a dedicated shower tent. We advise people to bring wet-wipes for impromptu washes in between available showers. Most days in Base Camp also start with a 'hot towel' delivered to your tent or dining table. Hot water is sometimes available to wash clothes on rest days and some of the lodges provide a laundry service for a small fee. You’ll get breakfast, lunch, dinner and snacks, as well as ample hot and cold drinks. We can cater for vegetarians as well as many other special diets as long as we are informed of this prior to the trip. All of our expeditions provide excellent local and Western food. If you have any special treats that you like, we encourage you to bring some along. When staying in lodges, expect local food such as dal bhat as well as Western-style dishes such as pizza or yak steak. At Base Camp, our well-trained cooks prepare high quality ‘Western’ food as well as popular local dishes - don't be surprised to see sushi, nachos and pad thai on the menu as well as Kiwi bacon, cheese and salami, fresh coffee and yoghurt. Please indicate any specific dietary requirements you may have on your application form as we are happy to accommodate those with specific diets. What are the lodges like? Can I have my own room or tent? The lodges that we book are tidy, clean and modern - the best that are available in each village. They are well-known locations to us and we have a good relationship with the lodge owners. We can book private rooms for you if that is a preference at an added cost. Our standard lodge-based trips are based on shared rooms, usually twin-share and sometimes triple-share. On camping-based expeditions and on the mountain you will share a tent with one, or sometimes two other climbers. No, our trip programmes all have an arrival day and a departure day built into them. You are welcome, and encouraged, to arrive a bit earlier to explore Kathmandu if you have the time. Before your expedition you will receive a “final details” letter. This will let you know the time and place to meet your guide(s). An AC representative will meet you at the airport and the first of many team briefings will take place on the evening of Day One. Please do not book to depart before the scheduled final trip itinerary day. 'E' tickets are the standard practice these days and are now acceptable in Kathmandu. Ensure that you print your itinerary and have your booking number with you, as this allows our local agents to assist with changing your return flight plans if need be, while you are in the mountains. Generally, we ask you to wait until 90 days prior to your trip start date to ensure your trip has met the minimum numbers and will operate. If you see a good deal and want to book your flights before this point, then ensure that you can make changes to your tickets or you run the risk of losing them if we do have to cancel the trip. In such situations, we are usually able to help you book on to an alternate departure, either with us or another operator. The problem with these tickets is that you usually end up having to pay quite a lot more if you have to make any changes to your ticket. Some of the places we go to aren't straightforward and we highly recommend using a travel agent for such travel, as there are many intricacies that they can help you with. In the long run they save you money! We use professional travel agents for all our staff and guides' travel bookings. You should fly into Kathmandu International Airport (KTM) and an Adventure Consultants guide or representative will be there to pick you up off your flight. If you are arriving before the scheduled trip start date, we can often make arrangements for a pick up, although taking a taxi is generally the easiest form of transport before your trip starts. Adventure Consultants can make reservations for you and can often make recommendations for attractions that you can enjoy while waiting for your trip to begin. Please let our office know your specific plans as we love to pass on Kathmandu sightseeing tips. Do I need to get a visa for Nepal? Yes. These can either be obtained on arrival into Kathmandu or can be issued prior through the online visa system. Be sure to have the correct USD amount in cash for your visa application and have a passport photo for your arrival in Kathmandu. Currently, a 40-day visa costs $40 and 90-day visa costs US$100. Once we have received your application we will email out a set of Team Reference Notes which provide an assortment of information including detailed equipment lists. Any questions you have after reading through this will be directed to our Equipment Coordinator, who can assist you in preparing for the trip as well as recommending and sourcing a range of clothing and equipment suitable for the climb via our gear retail service. Yes, these lists have been carefully prepared and please bring everything on the list! We will move our personal gear up the mountain in stages, but typically our packs are 30-60lbs/14-26kgs. This will be clearly stated in your recommended gear list. It will depend on where you are going but in general, you will need a sleeping bag warm enough for you in conditions that can be as cold as -20°C/-4°F. Blankets are generally not available so pay careful attention to the bag we recommend. We suggest buying a sleeping bag big enough to allow you to wear extra clothes in if it is especially cold. Sleeping in a warm hat can greatly improve a bag's warmth. You will carry your day pack with warm clothes, water, snacks, sun block, camera and whatever else you need for the day. Generally it will be light, 5 to 10kgs (10 to 20 pounds). On summit day(s) you will add your down jacket, technical climbing gear (which you will be wearing most of the time) and heavier gloves. Will there be any oxygen carried on the expedition? Is this included in our expedition fee? Most of our expeditions take oxygen as a medical backup. We also take PACs (Personal Altitude Chambers) with us. A trekker or climber with mountain sickness is placed inside the chamber and it is inflated around them. It increases the air pressure and any altitude related illness is usually immediately fixed. The climber then feels better and can usually walk down to lower elevations to recover. On Nuptse, there is the option to use bottled oxygen if you wish, at an additional cost. Climbers desiring oxygen would adopt our standard expedition package that provides you with 2-3 litres of oxygen per minute for the summit day above Camp 3 and 0.5 litres per minute for sleeping at Camp 3 before leaving. This is sufficient for an ascent of Nuptse, although we can arrange for a Max OX option should you want that option (4 litres per minute climbing and 1 litre per minute sleeping). All our guides carry extensive medical kits including various medications for altitude illness. If you have a previous history of altitude illness then please discuss this with us and your physician, otherwise there is no need to take preventative medication before or during your expedition. You need to bring any medications you regularly use (don’t forget to tell us about them) plus extra. Also bring a small first aid kit including a blister kit and mild headache medication for the normal altitude headaches. Can my friends and family join me on the trek to Base Camp? Yes, this is possible on some of our expeditions so please enquire with the Adventure Consultants office if interested in exploring this option. We cannot recommend enough being fit prior to the expedition as this will make all the difference to your success and enjoyment. You should be comfortable climbing at altitude while carrying a pack for 4-6hrs on most climbing days. Summit day will be longer, often 10-14hrs. Contact us for specific advice regarding training for your climb and check out our Fitness Training Programmes page. We have specific ideas around training and great book suggestions to help you along. Please look over our Fitness Training Programmes page for details. If you require more information please contact our office and we will be happy to put you in touch with one of our senior guides for a consultation and we can also link you with our training coach to design a training programme for you. On many of our climbs, we send daily internet dispatches and we receive updates from our guides while they are in the field. The best place to reach a loved one is through our office. Will there be any power source for charging batteries available throughout the expedition? What are the voltage requirements? We take solar panels and sometimes battery power packs on our expeditions. Our first priority is to charge our radios, satellite phones and expedition electrical equipment. There is usually enough power to then charge your personal electrical equipment. At the Base Camp we will also have a 12V electrical re-charging system, so bring 12V car-chargers for any electrical items that you wish to recharge. We cannot charge items in Base Camp that do not have a 12V cigarette lighter adapter, so please check that your appliance takes batteries or can plug in with a 12V cigarette lighter charger. We can cater for special power requirements at an extra cost or advise on purchase of a suitable personal solar charging system - please enquire with our office. For lodge-based trips, during the trek in many of the lodges also have power available with typical Asian plugs (two horizontal prongs) and offer recharging for a fee. We require each expedition member to have insurance to cover any personal or medical mishaps that may occur before or during the expedition. Click here for more information on expedition insurance. We recommend that you buy trip cancellation insurance upon sign up for your expedition or at the very least, at the same time as you pay for your flights and the balance payment. It is very important to buy trip cancellation insurance (in addition to your evacuation and comprehensive travel insurance) as it is not unknown for people to have unforeseen circumstances that force them to cancel their trips for reasons such as family illness, injury to one’s self, etc. Remember photos are wonderful records of your expedition but keep your camera gear simple and light to best enjoy the trip you are on. Disposable and digital cameras are the lightest weight, but all cameras have maintenance issues that need to be carefully considered before bringing them to high elevations. I have always recommended AC… Specially to people looking to climb the bigger peaks. Knowledge, logistics and experience are the paramount of my recommendation along with the importance of the great Sherpa Team. AC excels and I won’t go climbing with anyone else.